Reinforced with a proprietary synthetic mica, this material exhibits, in addition to its inherent outstanding chemical and hydrolysis resistance, very good mechanical and tribological properties. Fluorosint 500 PTFE (colour: ivory) has nine times greater resistance to deformation under load than unfilled PTFE. Its coefficient of linear thermal expansion approaches the expansion rate of aluminum and is 1/5 that of virgin PTFE, often eliminating fit and clearance problems. It is considerably harder than virgin PTFE, has better wear characteristics and maintains low frictional properties. 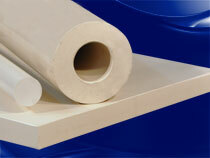 Fluorosint 500 PTFE is also non-abrasive to most mating materials. Fluorosint® 207 (colour: white) PTFE's unmatched dimensional stability, excellent creep resistance and white color uniquely position this material to serve FDA regulated applications. It is non-permeable in steam and complies with the FDA's regulation 21 CFR 175.300. Its relative wear rate is 1/20 the rate of PTFE below 150 °C / 300 °F making it an excellent choice for aggressive service bearings and bushings. FDA compliant Fluorosint HPV (colour: tan) is a high performance bearing grade of Fluorosint - optimized for high PV and very low "K" or wear factor. Fluorosint HPV was developed for bearing applications where other, low-tech PTFE formulations exhibit premature wear or simply cannot perform. FDA compliance gives food and pharmaceutical equipment manufacturers new design options and all benefit from its excellent load bearing and wear characteristics. Fluorosint MT-01 PTFE (colour: dark-grey) is an extreme grade developed specifically for applications where the benefits of PTFE-based materials also require strength, stiffness and stability. Fluorosint MT-01 PTFE delivers high mechanical performance at elevated temperature and as a result is often specified in seat, seal and wear applications where extreme conditions are present. Due to its unique PTFE matrix, Fluorosint's physical strength characteristics are not as high as other advanced engineering plastics profiled here such as Ketron® PEEK or Duratron® PAI (formerly Torlon® PAI). This compliance/ductility makes it ideal for seats and seals.